Skid Row have confirmed that vocalist ZP Theart is now a full-time member of the band. 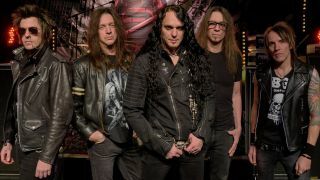 The former Dragonforce frontman was brought into the fold following the 2015 departure of Tony Harnell, with the band saying in December that they were recording with Theart. He’d been in the lineup as a touring member prior to hitting the studio. Now Skid Row have confirmed that Theart is a permanent member of the band. The news comes just a month after former singer Sebastian Bach reported that his manager Rick Sales was in discussions about a possible classic-era Skid Row reunion. The band say in a statement: “It’s official! After touring with the band for the past year, ZP Theart has been named the new lead singer for Skid Row. “The announcement originally came on stage during a performance in Nova Scotia to an overwhelming response. That was their first show of 2017. Skid Row have a handful of lives dates lined up for this year, with their next scheduled appearance in Las Vegas on May 13.